With this dimmable LED filament bulb from the gold series you can bring the real atmosphere for your lighting! Energy-efficient, long life 20,000 hours. E27 fitting. The E27 LED filament light bulb combines very low consumption and long life with the atmospheric appearance of the traditional light bulb. Both the extra warm white light color 2700K and the full light angle (360 °) are equal to the traditional incandescent bulb to be replaced. This LED light bulb is ideal for mood lighting, as the lamp has a beautiful and iconic style. You can use this filament lamp in decorative fixtures that create a unique atmosphere in your room. 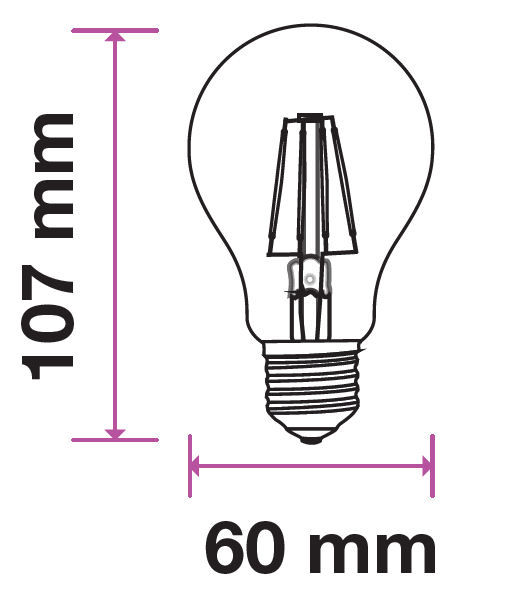 LED Filament lamps are increasingly being used in, among other things: restaurants, shops but also at home. This LED light bulb is suitable for E27 fittings and dimmable. Where the shape of the lamp is better known as the traditional light bulb, type: A60. By using high quality Epistar COG LEDs a high color rendering is guaranteed, CRI> 80. Every lit space will therefore get a very pleasant and familiar look through this filament lamp!